I think it's time to make an official post about Stila's status in Malaysia. As you all know, I've mention Metrojaya @ Brem has Stila sales and subsequently I've updated that all Stila counters are having sales as well even before it started and even before their counter managers knew about the "big sell out". They had to call their HQ to inquire when I went knocking at their doors with the news. Hence I was able to be the first one the next day to grab all the Stila goodies I have been eyeing on but no $. The NEWS: All STILA COUNTERS in Malaysia are having clearance of their stock (and I mean everything must go) up to 70% off. WHY? There are unverified sources that said Stila U.S taking back their franchise and they will be the only one selling (all other countries is facing the same situation as us). I know for sure Stila Malaysia is definitely not going to be around anymore unless some other company take over. "Stila’s distribution would only be in the USA and a decision by the principal and not us. 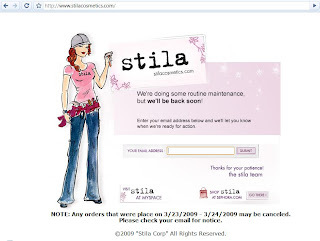 Should there be no changes, all stila counters will be closed by end of April or May which is why we are clearing all stocks now"
Current Stila management might be absorb by RMK cosmetics. Rumours has it that Luxasia is going to take in Smashbox to replace Stila. Further rumors is Stila might go bankrupt and in the States its up to 80% off! (why Malaysia only up to 70%? sigh? kedekut!). Then there's also rumours of Sephora coming to Malaysia. Lots of rumours? yes! even Stila Cosmetics site is unavailable atm! UNTIL APRIL/MAY/WHILE STOCKS LAST. HURRY UP IF U WAN TO RESTOCK YOUR STILAS AS BEST SELLERS ARE GOING TO BE GONE! This include holiday palettes/sets/smudge pot set/talking palettes/brushes are 70% off!! which means rm30-40 each only! for big ones u know! i saw online, brem started last month, few days sale under metrojaya advertisement. They clear all the old stock, and can be slightly cheaper or more expensive than other counters. Dam.. if i knew about it won't spend so much last month. I bought some items original price. have u go dior warehouse? btw i heard sumone told me tht there's no more Stila in Parkson Gurney. not sure whether it is true or not la thou.. maybe Penang ppL can verify tht?? Btw, Miu, me just came back from KLCC. Smudge pot set really habis. Our brushes are coming in 2 days' time. But still a lot people buying-eyeshadows, eyebrow stuff, powders, etc. 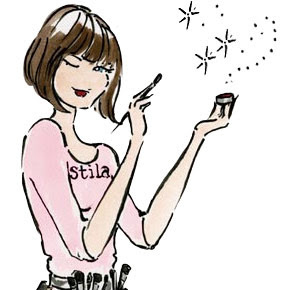 And I met one girl at Lilian's counter, she said yesterday she went to Stila at 1U, also not much stuff left. People smart, all going there already. Chirlyn: Dior, Anna Sui etc. I guess I can't go anymore as I'm very into Stila so no $$ for other things. It's gona close down from Msia. US having problems. The 2nd Dior Sales is the same sales. Same stock. Last Year they did the same thing too at Coronade and then at their office building for the tenants there. Wendy: I don't know sorry, probably Chirlyn knows? or it's the Isetan's sale up to 50% off on Anna Sui and some brands. Zera: sorry dear i duno Penang status how. Really close down? omg.. :( i hope some Penang ppl can confirm this? Von: I just went to 1u this morning, still got 12 boxes of smudge pot set left and other stuffs. A lot ppl go to KLCC to grab, but not 1u I guess? coz today i go still can grab things for Dee and Ayna. Kajal eyeliner in tiger's eye. Convertible in onyx and stone. huwaaa.. feel like crying, faster come weekend. wanna go grab sum stuffs, but cant get away until weekend. Miu, did u grab all the 12 boxes of smudge pot set? can you spare me 3 boxes like i originally wanted? Waa, u grabbed stuff for Dee already, then the ones that i ordered from Lilian for you guys, still want or not? Btw, Tiger's eye kajal liner still have at klcc, but no more onyx, like u and Ayna want. don't worry this was her updated list after i gave u the order! hahaha..
hw long a make up cn b stored? cz i hv many bt i still feel lyk buying stila's product..
u can keep up to 3 years then the quality might deteriorate. If it's been used (Exposed to your finger/germs/air) your cosmetics will not be good for long. There is a guideline and in every cosmetic packaging now there's a indicator of how long till open u can store it. I shall take a pic n let u girls see later. why cosmetics when open cannot keep long? bcoz it's expose to the germs in the air/hand/skin/lips/etc. Will dry up, deteriorate, germs breed etc. miu:u still have extra smudge pot set? chirlyn: dun have woah :( sorry.. i grabbed for my friends who asked me to. If i see somore i grab for u! Hmm... i'm going to go to one utama tomorrow i hope the counter still have some stocks. What about mid valley? emergency red code! who bought extra jade blOssom perfume, pls sell to me..
i went to klcc on the last day, everything finish so i bought a few lip gloss & the smudge pot left only green colOur. the canvas bag RM20 only & the bronze is only RM32.